When our son, Keller, was seven weeks old we took him to Belize for our closest friend's wedding. It was a little “Planes, Trains and Automobiles” involving a flight from LA, a layover in Houston, another plane to Belize, an even smaller plane out to the islands, a cab ride, and finally a boat to the hotel. Keller handled it like a champ and it was definitely an adventure. We took him on a boat ride, did some snorkeling, brought him to the wedding in a tiny suit and got a little bit of relaxation, at least as much relaxation as a seven week old allows. Keller has since been to 16 countries and some of them quite off the beaten path like Serbia, Bosnia and Slovenia. This summer we’re planning a trip to drive the rim road in Iceland and meet some friends in Italy. I have so many fun memories of going skiing with my family and family friends. My family didn’t have the money to travel to exotic locations with us so there were a lot of road trips to grandma and grandpa’s condo in Mammoth. I’m so grateful to have had so many active years with my grandfather and for his generosity in exposing me to the skiing. Later we would go to our friend’s home in Lake Tahoe and ski with our family and a bunch of friends. We had epic snowball fights including forts and strategies. I hope we can instill that level of fun and creativity into Keller’s travel life. I try to view the challenges of family travel as just that, challenges, and not let anything make it a complete fail. 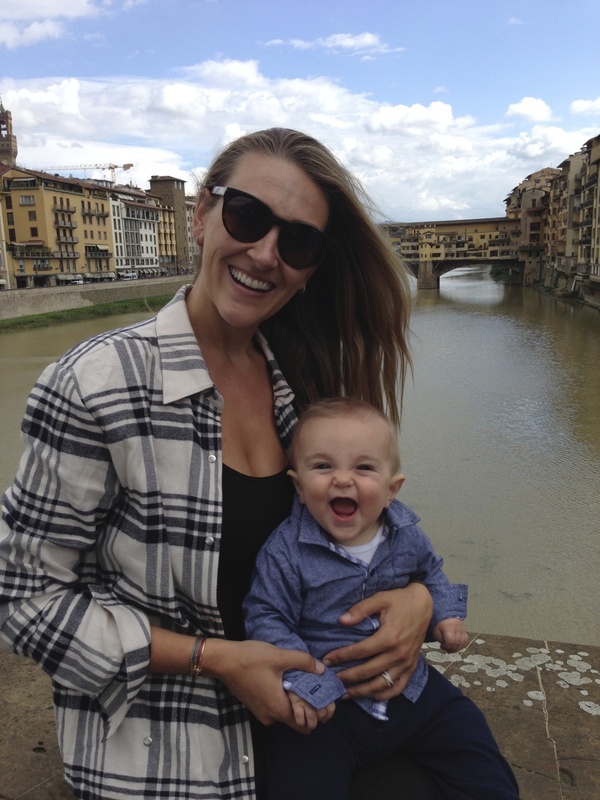 We’ve had the blow out diapers, been covered in poop and forgotten the breast pump, but modern travel allows that no matter where you are in the world, there's a solution. I will admit we’ve had a few epic fails, including our last international trip to Istanbul, when Keller was just over a year. He was up all the first night and somehow discovered where we'd hidden all of his snacks. Exhausted and completely upside down in time change, he was literally flying around the room, demanding that his snacks be opened and eating almost all of them. It was a wild night with no sleep but we made it through somehow. Traveling with kids is just about a change of perspective. Since having Keller, people everywhere in the world are so kind and helpful to us when we travel. We make friends, borrow babysitters, get recommendations on great things to do with kids, find the store to buy more snacks or get that missing piece of the breast pump even on an island off Belize. Charley and I travel to his family’s home in Montana every year. It really is “the last best place” with huge mountains, space to roam, an organic vegetable garden, campfires and a clean, glacial lake. It allows us to disconnect from work and life in a city and reconnect to each other, family and nature. Lately, we’ve been driving up each year with Keller and our two-year-old rescue golden retriever in tow. It’s tough with Keller still being so young but we all settle in, find a cool route and stop in towns we’ve never explored out on the west coast. This is a hard one! There are so many places to go in the world. We’ve covered a lot of it with over 60 countries under our belts, but if I had to choose just one trip for Charley and I alone it would be a trek through Bhutan. The country is so untouched and hard to get to that few people get to experience it. It values “gross domestic happiness,” which is just exceptional! We'd be hiking and exploring, seeing new cultures, connecting with nature and a little mediation. If money grew on trees, my dream is to do it all through the Aman Hotel Group for an added dose of complete luxury at the end of long hikes. Bucket list with family is to go back to Africa when Keller is old enough. Our last trip was to Kenya to climb Mount Kilimanjaro, but with Keller, we'd fly into South Africa, drive up the west coast and then head into Botswana and end with a self-drive safari through Namibia. Q: Where do you send first-time visitors for a family day and kid-free night in your hometown? Los Angeles is as fun for kids as it is adults. I would start the day in Venice Beach at a small, little known breakfast joint and coffee shop called Gjusta and then wander around Abbott Kinney to sneak in some shopping for moms, dads and kids, then hop on bikes and cruise north to Santa Monica for a day at the beach. Later in the afternoon, I would go to the Brentwood Country Mart and pick up Redi Chik chicken baskets for lunch and sit outside at the picnic tables. There’s a nice kids store called Poppy and a toy store as well as amazing book, clothing and jewelry shops. For ice cream, I love Sweet Rose Creamery, and always grab healthy to-go snacks from Farmshop. Dinner would have to be at my favorite Santa Monica restaurant, Tar & Roses, an amazing spot for Italian food and wonderful wine selection. For Keller it’s really about comfort while looking cute, so I prefer some kind of sweatpants that look decent (I love Nununu for style) and a super soft sweatshirt in case it’s cold on the plane. My traveling uniform is skinny-jeans (my favorite are FRAME for their flattering and “bounce-back” traits), comfortable but well cut drapey T-shirts (Rag & Bone makes some in a fabric that’s a little thicker and looks nicer than a basic T) and my Andraab cashmere scarf from Jaipur, which is the softest scarf I've ever felt and large enough to act as a blanket. I wear ankle boots (Isabel Marant ones in black are low enough to walk all day in and cool enough to wear out at night) and usually bring several of our august bags. We make one called the Campsbay that’s a keep-all for my things and holds one of our smaller Marais totes filled with Keller’s needs inside of it. Finally, I always throw in a Portofino Pouchette and a Ravello fold over because I can store make-up or snacks or my ipad in them, but then they make great clutch bags at night. Charley’s uniform is cargo-pants, for extra pockets (he prefers an elegant pair from Brunello Cuccinelli), a basic white J.Crew tee and a button down shirt. He prefers these very soft and easily removed Loro Piana shoes and, depending on where we are going, the Zegna Traveler sport coat or his Loro Piana Voyager jacket that’s a bit warmer and less dressy. An ADVENTURE (that’s a nice way to put it)! An august tote filled with snacks, milk, bottle, diapers, wipes, back up clothes, an ipad loaded with elmo, and “Mono” his very special (stuffed) friend! Wine on tap! Plus extra large closets with already set up Pack n Plays (you know you do it too! ), jogging stroller for exploring the city, a fridge stocked with healthy, organic, toddler friendly snacks, a changing station, and in my dream hotel room… a train set.